Do you owe thousands of dollars for a years-old utility bill you never knew your tenants hadn’t paid? Did you know that unpaid bills from public utility providers can easily become a lien on your property? (3) Charges for services furnished [by a public corporation, including those providing water, sewer, power, gas, and television among many others] to a premises may be a lien on the premises, and those charges delinquent for 6 months or more may be certified annually to the proper tax assessing officer or agency who shall enter the lien on the next tax roll against the premises…and the lien shall be enforced in the same manner as provided for the collection of…the taxes… However, in a case when a tenant is responsible for the payment of the charges and the governing body is so notified in writing, the notice to include a copy of the lease of the affected premises, if there is one, then the charges shall not become a lien against the premises after the date of the notice. In the event of filing of the notice, the public corporation shall render no further service to the premises until a cash deposit in a sum fixed in the ordinance authorizing the issuance of bonds under this act is made as security for the payment of the charges. A municipality which has operated or operates a water distribution system or a sewage system for the purpose of supplying water or sewage system services to the inhabitants of the municipality, shall have…a lien upon the house or other building and upon the premises, lot or lots, or parcel or parcels of land upon which the house or other building is situated or to which the sewage system service or water was supplied. any unpaid utility bills do not because liens. However, you must also submit written notice to the utility company giving them 20 days’ notice before a change or termination of the lease, or this rule goes out the window. Furthermore, if the agreement for a non-water, non-sewer PUC does allow them to put a lien on your property, there’s nothing you can do about it. The law that allows you to circumvent the liens only applies to water and sewer utilities. 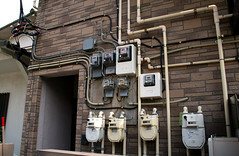 Which means you might still be caught off-guard by liens from electric, gas, and other PUCs. A U.S. District Court judge, the Honorable J. Curtis Joyner, ruled in March against utility giant Philadelphia Gas Works (PGW) and in favor of a small group of landlords including Richmond Waterfront Industrial Park LLC (RWIP), creating a precedent that could save landlords all over the country a mountain of headaches regarding utility liens. At issue: PGW had placed a utility lien on one of RWIP’s properties without providing notice that the bill was ever overdue or that lien has been issued. RWIP simply received a blanket “pay now or we take the property” demand to which they had no options other than to lose the property or pay tens of thousands of dollars due to the bill having collected penalty fees every month for a decade or more. They argued that the process that allows landlords to be completely blindsided by these liens was a clear violation of their Constitutional right to due process. “PGW’s methods do not meet the fundamental requirements of due process in that they do not afford the plaintiffs and others like them the opportunity to address their tenants’ arrearages at a meaningful time or in a meaningful manner,” Joyner wrote in a 27-page memorandum, ordering a future hearing on what precisely will be mandated to enforce the landlord’s due process rights. This obviously doesn’t apply to the aforementioned water and sewer companies, due to the law that allows you to declare the liens invalid in the first place — but for any other PUCs operating in your area, it’s a big step forward. When Should Landlords Require Renter’s Insurance?